The 15th November is the most important day of the year because it's time to celebrate Neopets's Birthday! Are you ready for the party? Keep reading our article and maybe you'll find some interesting ideas to create your own outfit! If our spiffy Neopet wants to make the early hours in the morning during the Neopets Birthday Celebration, then he'll need some pieces of cloth that are both glamorous and comfortable! This cheap and nice wearable was a bonus item awarded for completing all 4 quests in the 2011 Festival of Neggs. Don't worry if you missed the event, because you can easily buy it in shops for around 5,000 neopoints a piece. The Dapper Yellow Shirt and Green Jacket is elegant but not too much formal and it fits for both younger and older Neopets. This is a really underestimated wearable, probably due to its vivacious, vivid colours, but we think it's really perfect for a great event like this! This adorable garment is also very versatile and you can use it for Spring-and-work- themed customisations as well. This shiny, gold item was awarded to those who voted every day during the Neopia's Style Showdown in 2010. The Golden Cravat is a bit hard to find because it is a retired wearable. You can buy it at trading post for around 800k. It is not the most cheap item in the whole Neopia, but this is a really stylish accessory! Due to the lack of multispecies wearables for male pets, we believe that this cravat is a great closet and wallet investment because you can't actually find anything similar at the moment. So it is considered like a really unique item. These pair of trousers must be in everyone closet because they are cheap, spiffy, comfortable, versatile and they also look great on almost every species! They can be used in a lot of very different outfits, as their neutral colour easily reminds us of jeans and we know in how many different occasions we choose to wear our pair of jeans! If you still don't have the Hardy Blue Trousers, you can handily buy a pair in shops for only 10k each. It's a real bargain, isn't it? For 80k a pair, you can find these brown, spiffy shoes in user shops. The AAA Host Shoes are refined, comfortable and you can use this item in a lot of customisations due to its neutral , dark shade. This cheap item cost only 4k neopoints a piece, and is able to add a touch of class to every aristocrat, old style customisation! Its colour also matches perfectly the other items used in our outfit, so we couldn't avoid to choose it. 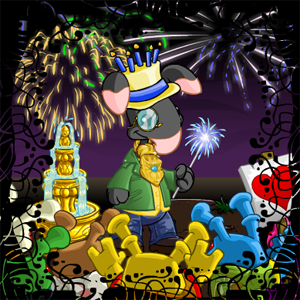 This sparkly, glittering blue and gold hat came out of the Neopets 9th Birthday Goodie Bag and it costs around 200k. It is an accessory for really special occasions, like the Neopets Birthday. It surely looks fun, and a bit odd but it is absolutely recommended to celebrate an event such this one! There isn't a more appropriate item than this for a party! Spending only 4k neopoints a piece, you can buy this shiny, funny Sparkler! Thanks to its cheap price, it really can be considered as a great closet investment; in fact you can also use it for other customisations like the New Year-themed one. This awesome, exciting background costs around 75k neopoints each. It is really detailed and it is one of the most nice neopoint background you can find in the whole Neopia. It presents dark shades of purple and brown, but the shining fireworks pleasantly enlighten the scenery. How splendor! Show your happiness for what we are celebrating adding this pleasant foreground to the scene! The Grundo Admirers Foreground is not only a colourful, cheerful item but it also very cheap; in fact, you can buy this item in shops for only 4k neopoints. This adorable higher foreground item (it is displayed among the higher foreground items even if it sits on the ground) costs 1,5k neopoints only. 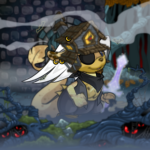 The Golden Water Fountain colours match perfectly with the other items used. It is a really versatile item that you can choose for Spring-, Summer-, Altador Cup-themed outfits also, so you should really consider buying it if you don't have it in your closet yet! The last touch to complete the outfit is adding a frame like this one. This really fine and graceful item costs only 5k neopoints and it is perfect to make meaningful this outfit without overloading it. Why don't you organize an awesome party to celebrate the Neopets Birthday? The Long Silver Wig is one of the most elegant, interesting wigs you can find out there. It looks nice on almost every species and it is also really versatile due to its neutral light grey shade and its simple hairdo. It costs around 45k neopoints, but we are sure that you won't regret your purchase! For only 10k neopoints a piece, you can buy this vivacious, comfortable piece of clothes. It is actually well refined and embellished with a graceful, plain golden embroidery. We are sure that the Fancy Brightvale Gown wouldn't sit in your closet collecting dust for months if you decided to buy it! These pretty shoes cost only 4k neopoints a pair. They are cosy and elegant at the same time and you can use them in every Spring-, Summer-, Illusen-, naturalistic-related customisations. The delicate green shade of these graceful slippers matches perfectly with the Fancy Brightvale Gown, but we bet you noticed it by yourself! This beautiful, branded new Eye Shadow came out during the last Festival of Faeries a couple of months ago, together other five different shades of eyeshadow. You can find it at the trading post for around 250k neopoints a piece. We know that it's not very cheap at the moment, but you can wish for it at the Wishing Well thanks to its low rarity! 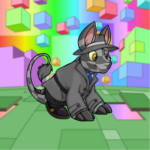 It can be a nice closet investment because it gives both a smart and charming look to your Neopet at the same moment independently from the outfit you're planning for your conceited, spoiled female pet! This sparkly green and pink necklace could be find when opening a Neopets 8th Birthday Goodie Bag. It's running around 55,000 neopoints, and it is a really nice accessory. The Green Neopets 8th Birthday Bead Necklace is an underestimated item, and you can rarely see it on a pet, but we think that is perfect for our customisation because it adds a touch of class and glee to your Neopet. You can buy this delicate, soft green background at only 1,900 neopoints. It is a great alternative to those en plain air backgrounds that are used over and over again. This background also helps to create a nice merry atmosphere and, thanks to the buffet you can easily notice on the right, it's also perfect for our party organizing purposes. This tiny, nice trinket was awarded during the 2010 Daily Dare. If you missed the event you can easily buy it in shops at only 700 neopoints a piece. The Turmac Sushi Roll is the perfect handled item to offer a tasty snacks to your guests! This giant, red and pink cake could be obtained by redeeming a $10 Neocash Card in November of 2009 and it is a bit expensive; you can find this lower foreground item at the trading post at around 400k. The 10th Birthday Red Scorchio Birthday Cake is the masterpiece of every Birthday Party! Thanks to this delicious and well-garnished cake, your party will be a real success and it will remembered by your friends for a lot of time! This adorable foreground item is cheap and really versatile. In fact, you can use it for almost every nature-, adventurous-themed customisations. At around 2,500 NP at a piece, we think that Shrubbery is a cheap must have item! You can buy this lovely, vivacious higher foreground item for less than 100k each. The colourful balloons and streamers are essential and of primary importance to give a warm welcome to your guests! The day after a great party there is always someone who has to clean and tidy the house up! Why don't you face up to these tedious tasks dressing a stylish outfit? This customisation is so neutral that can be worn by both for male and female Neopets. The White Top Chop Robe is randomly awarded when playing Top Chop. It is a great alternative to another cheap, essential garment, the Basic White Shirt, and it costs only 300 neopoints a piece. This nice robe is simple but not trivial and it is also really versatile. 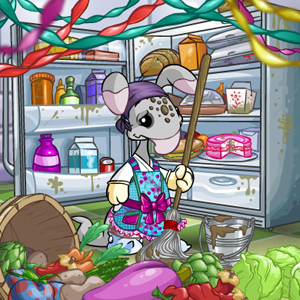 This comfortable, soft pair of pyjama trousers are perfect for this outfit: our Neopet went to the kitchen to have some breakfast and found out this big mess. So, still wearing their pyjamas, they started tiding the room up. Running at around 1,8k neopoints only, they are a real bargain! The Berry Splattered Apron was a prize of the Y13 Festival of Neggs. If you missed the event, you can easily find it in shops running at around 6,5k neopoints. This apron is very detailed and has really bright colours; it is waterproof and easy to wash as well. In spite of its big purple bow, the Berry Splattered Apron is suitable for all the male and female Neopets who need to clean their house after a huge party like this. This item was a prize of the 2009 Daily Dare and if you missed the event you can buy ta pair at the trading post for around 370k neopoints. These gloves are a bit expensive but are a great closet investment thanks to their extreme versatility. Using the Deluxe Polarchuck Costume Gloves, your Neopet will keep their paws always warm and clean. Moreover, paws will not result chapped by the contact with the floor cleaner, how nice! This item was awarded during the 2008 Daily Dare and if you missed the event, you can easily buy them in shops at around 10k neopoints a pair. Why wear rigid shoes when you have the opportunity to put on a pair of stylish, soft, comfortable and warm socks? The Snow Wurm Socks are also non-slip, what a bargain! This item was a prize of the 2012 Daily Dare and its price is around 2k neopoints. This rarely used, underestimated face paint easily gives the idea of a Neopet who has a mud stain on their snout! This item was a prize of the 2010 Daily Dare and if you missed event, don't worry; you can find it in shops at around 39,000 neopoints a piece. The Dueling Decks Purple Head Bandana is essential to prevent your Neopet's hair from becoming messy! It is also a great closet investment because you can easily use this spiffy bandana in every thief-gypsy-sorcerer-pirate-themed customisations. This item was awarded during the 2011 Games Master Challenge and it is very cheap, running at around 1,2k neopoints. The Soiled Mop and Bucket will be your Neopet best helper to clean all the house as soon as possible... if someone cleans it before starting using it, though! This nice and brand new lower foreground item costs around 30k neopoints a piece. The Basket of Vegetables gives the idea of the chaos guests leave behind them when they go away from your party. Will your Neopet be able to tidy up all these cabbages, peppers and artichokes before the vegetables go rotten? It looks like that they are not that happy to accept this challenge, unfortunately. This item was a prize for the 2012 Altador Cup VII Staff Tournament and it costs around 28k a piece. The party is over and all your Neopet can do is to remove and throw away the hung, consumed streamers. How sad! They can be a fan of recycling though, so they can just remove them and keep them for the next party... nobody will notice that these streamers are always the same, right? Well, this brings our article to an end. We hope you enjoyed our ideas and found some new garments to buy among the ones we presented. We are quite sure that many of the cheaper items listed above are already in your closets or safety deposit boxes collecting dust, so why don't you give a deeper look at your neopoint wearables for your next Neopets-Birthday-Party-themed customisations? 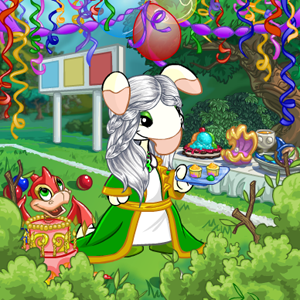 Have fun dressing your pets up, and happy 15th Neopets Birthday, everybody!